Mumbai Indians (MI) won their maiden Champions League(CL) Twenty20 title, beating Royal Challengers Bangalore in a series of the Indian Premier League stalwarts in Chennai on October 9. 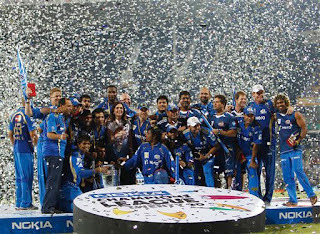 Batting first, Mumbai Indians scored 139 for all out in 20 overs and later with superb bowling effort by skipper Harbhajan Singh stopped RCB on 108 only and won all-Indian final by 31 runs. With this win, Mumbai Indians became the second team after Chennai Super Kings in 2010, to claim the CLT20 crown. Lasith Malinga of Mumbai Indians player was declared Man-of-the-series. 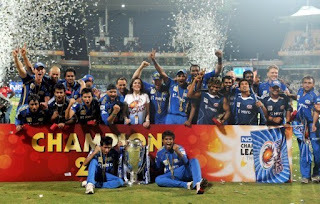 great performance of Mumbai indians.